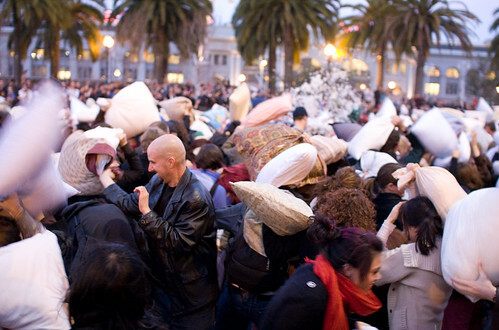 I celebrated Valentine’s Day in the middle of a several-hundred-person pillow fight. It was amazing and beautiful and a great outlet for the anti-consumerist singledom disdain I carry for that day. Throughout the battle, I kept my glasses safely in a case in my pocket and lunged face-first at the whump-thwumpers. Eventually, my neck got tired of being pummelled, and I stepped out of the fray to pick feathers out of my teeth and shirt. I put my glasses back on to get my bearings just before WHACK!, they were smashed off my face by an errant pillowfighter and buried under a groundcover of feathers. Panicked, I grabbed the five closest bystanders and had them hunt for me. One very well-meaning man found my beloved glasses. After he stepped on them. Once upon a time, I used to wear contacts every day. I took this as a sign that maybe it was time to go back to them, and I carted myself to Lenscrafters the next day to get sized up for them. After a day of dilation-induced disorientation, I was home again. Contacts! Peripheral vision! Freedom! But one major thing has changed since I was a daily contacts wearer: I no longer have hair. So, despite the fact that the contacts feel completely and utterly freeing, I was weirdly disturbed when I looked in the mirror. On days when I don’t wear makeup (which is about 50% of the time), I now look… really naked! It’s jarring how much comfort we find in having some sort of shield between us and the world. Bangs to hide our worry wrinkles and long hair to curtain our cheeks. Foundation to hide our blushing. Shades to hide our tears. We paint dark lines along the edges of our eyes to remind people to see us directly, and then we shield them with lenses and frame them with angles and curves — thick and thin — to change the shapes of our faces. When I make all that go away, I look uncomfortable. I look vulnerable. I look scared. So it was back to Lenscrafters today, urgently looking for face jewelry. Give me something that will dress me up when I don’t have the motivation to do anything more than put on my glasses. Make me safe again. I’ve got the contacts — I know how to look like myself. Now give me something else! I went for bigger. I went for quirkier. I went for something that would announce a confident style without any extra input from me. But now I’m safe again. And now can go back to putting effort into appearing transparent. Whew. ahve had glasses since ah was 9 n contacts since ah was 14. Ah love my contacts n having completely focused peripheral vision. But thars days when tha mask of a good pair of glasses is quite comforting, in a way that throws even me off. It’s only recently that ahve actually put effort intae findin glasses that ENHANCE my look, but it was a welcome discovery. But really, ah dont wear them often, cuz ah git that moment of “holy shite ah cant see anythang” when ah take them off ta clean. yer frames are bangin, btw! btw, what tha HELL is up w. needin a un-expired prescription fer contacts er glasses? It’s nawt like thar vicodin or birth control or cannabis! If anyone ken tell me why its NAWT an insurance scam, please elaborate! so attractive to do! artistic! I look forward to more posts, my buddy, nice posts!